Successfully saved Secret Ingredient Cheesy Garlic Bread to your Calendar. You can also save the ingredients to your Grocery List. 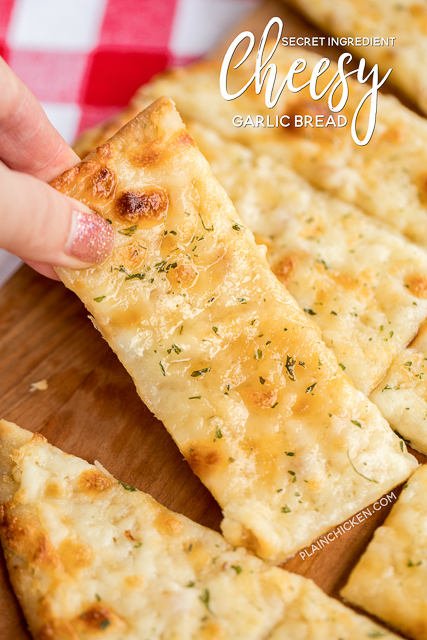 Secret Ingredient Cheesy Garlic Bread - 5 simple ingredients and ready in 10 minutes! Pizza crust, mozzarella, garlic, butter and the secret ingredient! Quick and easy bread recipe. Everyone LOVES this easy bread! !